The Bible does not explain why the name of Saul, the early persecutor of Christians, was changed to Paul, but also the Bible does not discourage speculation on the point. Undiscouraged, then, let us speculate. 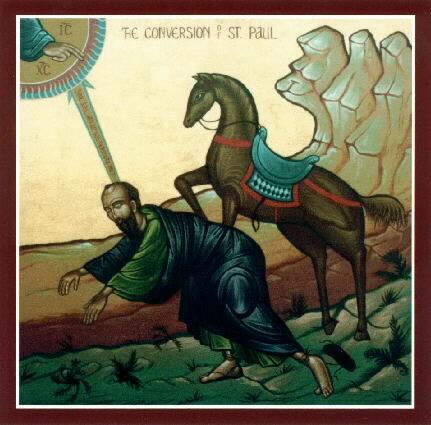 Among Christian readers over the centuries, however, the change from “Saul” to “Paul” has usually been associated with the man’s conversion from persecutor to Apostle. Thus, when William of St. Thierry published his commentary on Romans in 1137, he began the work with this prayer: “Thou hast known Saul, who derived the form both of his persecution and his name (formam trahentem iam persecutionis quam nominis) from a proud king and a persecutor, but Thou hast not known him from afar. For Thou didst humble him like a proud man wounded, and by the Spirit of grace, Thou hast changed him from Saul to Paul” (Exposition of Romans 1.1). He began life, then, as Saul. Since the Apostle bragged to the Philippians that he was a Benjaminite (Philippians 3:5), it is not surprising that his parents would have named him for that ancient King Saul, who was a member of the tribe of Benjamin. The circumstances of his conversion, I believe, prompted this change. Let us recall that the Lord, when he encountered Saul on the road to Damascus, shouted out to him, “Saul, Saul, why do you persecute me?” When he heard that voice of reproach, Saul immediately recognized the irony of his name, an irony enunciated in Jesus’ very question. He recognized that voice. It was the voice of David wandering in the desert, during that period when he was pursued by Israel’s first king. The great sin of the ancient Saul, as Holy Scripture describes it, was his persecution of the Lord’s Anointed One. When the future Apostle heard that question—”Why do you persecute me?—he was confronted by a massive fact: Just as the ancient Saul had persecuted David, this new Saul was persecuting David’s son! And this persecutor recognized the same voice of reproach. The correspondence between the two cases is clear in the relevant Greek texts. Jesus asks Saul, Ti me diokeis —”Why do you persecute me?” (Acts 9:4; 22:7; 26:14). The identical verb, dioko, appears several more times in reference to the same persecution (Acts 9:5; 22:4,8; 26:11,15; 1 Corinthians 15:9; Galatians 1:13,23; Philippians 3:6; cf. 1 Timothy 1:13). In the Septuagint of 1 Samuel 24:15, David asks Saul, “Whom do you persecute—katadiokeis?” Again, in 1 Samuel 26:18, David inquires of Saul, “Why does my lord persecute (katadiokei) his servant?” This stronger form of the verb, katadioko, is used several more times with respect to Saul’s persecution of David (1 Samuel 23:25,28; 25:29; 26:20). Hearing this, Luke tells us, Saul was struck with blindness, like the blindness of Israel’s first king, in the dark cave at Engedi. And during those days of darkness Saul could still hear ringing in his ears, the same question that David had put to his own persecutor. This accusing voice would haunt the Apostle for the rest of his days. In his former life, he imagined himself God’s faithful servant, but Paul learned that he had been, in fact, just another Saul.